The Great Nebula in Carina is the showpiece of the southern hemisphere, larger than the Great nebula in Orion in appearance. Its distance is estimated to be 6500 to 7000 light years and it shows beautiful and intricate structure in small telescopes. The region also contains several open star clusters (e.g. Trumpler 14 and 16). Trumpler 14 is only about one-half million years old. At the upper edge of the image, right of center is the nebula NGC 3324. 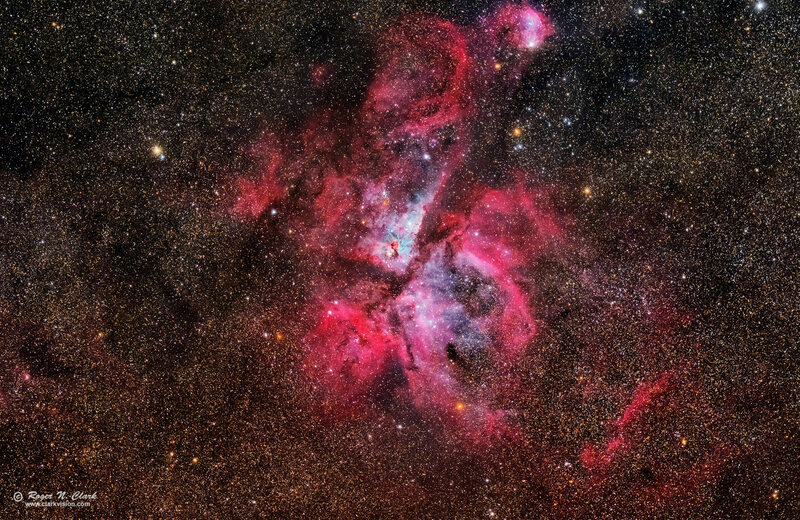 In the center of the image is the star Eta Carina, a hygergiant star with a luminosity some 4 million times more than our sun. Technical. This image was obtained with a stock Canon 7D Mark II 20-megapixel digital camera and 300 mm f/2.8 L IS II lens at f/2.8 and ISO 3200. No dark frame subtraction, no flat fields. Tracking with an Astrotrac and no guiding. Forty three minutes total exposure (86 30-second exposures). This image shows the full frame after stacking. This image was obtained with My Very Portable Astrophotography, Landscape and Wildlife Photography Setup.